It is open to conjecture whether this image of the Buddha decked in finery belongs to the Mahayana or Theravada tradition. The jewelry -diadem, pectoral chain and vestimentary ornamentation- is typically Burmese. Certain decorative motifs such as the flowerets and erect pendants, which also appear on the arch and window frames of local monuments, apparently derive from Pala or even Khmer art, via the kingdom of Sukhothai. With his right hand the Buddha is making the mudra or symbolic gesture of giving (varada). This representation conforms to the specific esthetic of the Pagan classical period and relates directly to sculptures discovered in monuments dating from the historical and artistic heyday of the great Burmese capital between the 11th and 13th centuries. Nevertheless, the flat, square face suggests a slightly later dating. 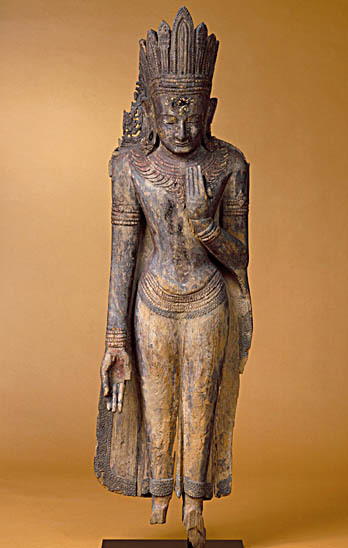 The teak statue, formerly lacquered and gilded, was sculpted from a single tree trunk. A few images featuring the same iconography have been discovered in various temples in Pagan. Although the sack of the latter city by the Mongols in 1287 led to a certain degree of decline and division in Burma, it by no means put a brutal halt to artistic creation, as attested by this work.